Collaboration between university and college information technology departments can lead to faster, better services on campus at a lower cost. 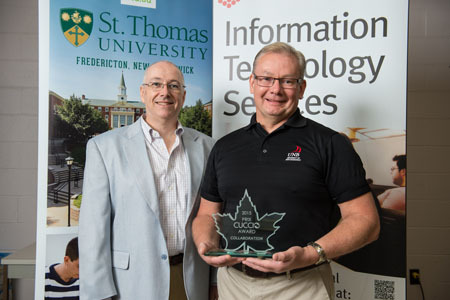 The NB/PEI Education Computing Network (ECN) consortium of universities and colleges in New Brunswick and Prince Edward Island was recently recognized for its collaboration of IT services by earning the inaugural CUCCIO Collaboration Award. The network includes the University of New Brunswick, l’Université de Moncton, St. Thomas University, Mount Allison University, Maritime College of Forest Technology, Maritime Provinces Higher Education Commission, the University of Prince Edward Island and Holland College. These members have worked together to provide networking, joint procurement and professional development opportunities over the years. Recently, the ECN completed an important federated identity project, in cooperation with the Canadian Access Federation, which allows a user at one member institution to access IT services at another institution. This forms a foundation to build new ECN shared services, such as a shared data centre or applications like SharePoint. The CUCCIO Collaboration Award recognizes initiatives that promote collaboration within the higher education IT sector between users, faculties or departments, campuses or institutions. “The NB/PEI ECN is one of the most successful higher-ed IT consortiums in Canada,” said Terry Nikkel, Associate Vice President of Information Technology Services at the University of New Brunswick, who accepted the CUCCIO Collaboration Award on behalf of the group. “We have learned how to work together effectively, with the common goal of deploying leading-edge technology across the ECN—whose members range in size from a few hundred student, to many thousands—while reducing overall IT costs for all." “The NB/PEI ECN is a great group to work with,” said Dan Hurley, Director of Information Technology Services at St. Thomas University. “Having our collaborative activities recognized underlines what a great job we have done working together to provide services to our users. CUCCIO is a non-profit, member-funded corporation representing more than 50 universities Canada-wide, who collectively serve over 90 per cent of Canada’s university students. The awards program is designed to honour individuals, groups or institutions whose work exemplifies CUCCIO’s efforts to build and support Canada’s higher education IT community. The awards were presented for the first time in June, as part of CANHEIT, Canada’s only national higher-ed IT conference, held this year at the University of New Brunswick in Fredericton.